A piano with a beautiful and durable set of keytops is more likely to be appreciated than one with a beatup set of keys. The luxurious feel of topquality keytops invites one to sit down and play the piano. On the other hand, when old keytops have become discolored, chipped or broken off altogether, playing the piano becomes more of a pain than a joy. The keytops on your piano have deteriorated to the point where replacement is in order. I would suggest that a professional installation of a new set of keytops be considered. Don’t plastic replacement keytops look cheap? A badly installed set of plastic keytops certainly can detract from a piano’s appearance. In such a case the fault, however, is not in the keytops themselves, but in the lack of proper techniques used to install them. In particular, jobs done by doityourselfers or flybynight repairmen tend to turn out badly. 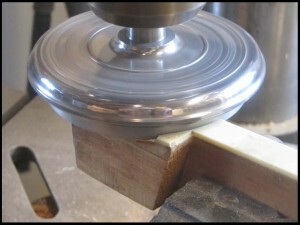 Poor or inadequate finishing techniques can result in illfitting keytops that slop over on the edges and are unevenly notched around the sharps. 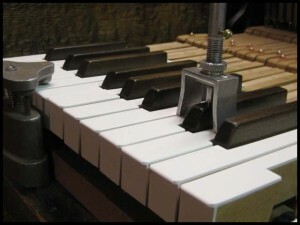 Even worse is when replacement keytops sit on top of the poorly prepared surface of the wooden keystick in such a way that they are not level and are prone to popping off. Done correctly, however, replacement keytops will mimic the appearance and durability of a factory installation. For this job to be done, would you be replacing the keys entirely? No, only the keytop material would be replaced. The wooden portion of the key, called the keystick, would be retained. New keytop material which is now available for installation is extremely highquality, beautiful in appearance and with a silky touch that closely approximates the feel of real ivory. Will replacing old ivory keytops with a product other than genuine ivory lower the value of my piano? 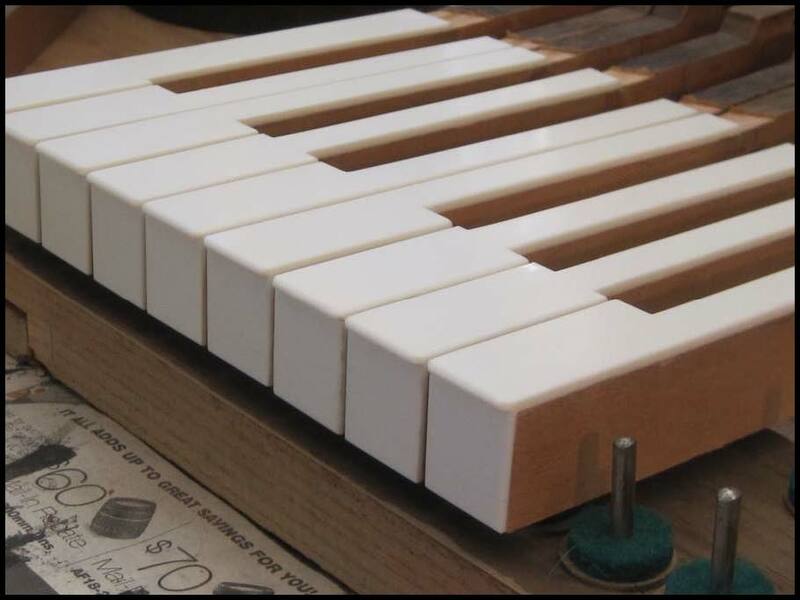 Are plastic keytops as durable as genuine ivory? Much more so, actually. The acrylic plastic used nowadays is very resistant to damage. The keytops are slightly thicker than the originals, and lie absolutely flat without any of the waviness that is common with older style replacement tops. What are the basic techniques used to replace keytops? erally saved for recycling. Otherwise, the old tops are milled off along with a precise fraction of an inch of wood which is removed from the top of the keystick to compensate for the greater thickness of the new keytop material. This milling down process gives a completely flat surface on which to glue the new keytops. The new tops are glued to the keysticks with a special adhesive which produces a rock solid bond between the keytop material and the wooden keystick. 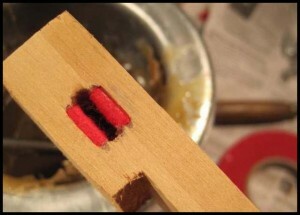 This type of glue creates a bond stronger than the wood itself. 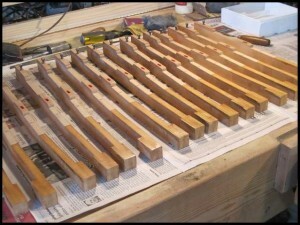 Once the keytops are glued in place, the exacting job of fitting the keytops to the keysticks may be done. How is a set of keytops correctly fitted, if this is such a big deal? The first thing to understand is that the new keytop material is intentionally oversized, to allow for slight differences in the width, length and thickness of keys from various manufacturers. Thus, the process of filing down the keytops to the correct dimensions is a vital step in producing a set of keytops which looks professionally done. 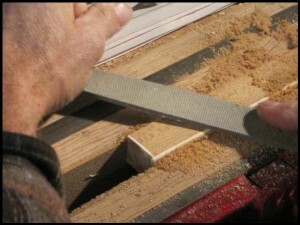 Although machinery may be used to mill off the bulk of the excess material, the final finishing is done by hand, using files to produce an edge which is perfectly flush to the wooden keystick. When done correctly, there will be no overhanging edge along the sides of the keys. Where would the work be done, if the decision was made to replace the keytops of our piano? This type of job is done in the shop. Fortunately, only the set of keys and possibly the keyframe needs to be removed and transported to the shop for the work to be done the piano itself remains in your home. Are there ordinarily other repairs which should be done at the same time as a job of keytop replacement? replaced in the piano. Paper punchings as thin as .001″ may be used under the centers of the keys to ensure that the keytops are absolutely level. The sharps (black keys) should be leveled as well. Even better, the job of action regulation could be done when the keys are returned to the piano. Regulation involves putting all the adjustments that were made to the action in the factory back to their original settings, giving you the most responsive touch possible for your piano. Another repair job which might be considered is having the key bushings either treated or replaced. 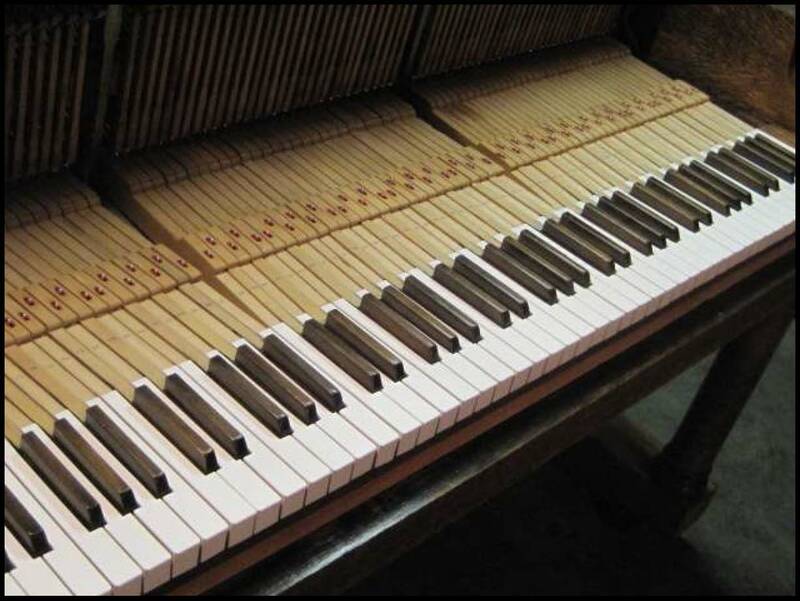 If the keys of your piano have a lot of sidetoside play, or wobble, the bushings are not doing their job. In some cases, a liquid treatment followed by sizing may be effective. In more drastic situations, removal of the old bushings and replacement with new might be called for. With a new set of keytops installed and other related work attended to, the appearance and touch of the keys will be very close to what the piano was like when it was on the showroom floor as a new instrument. A professionally installed set of replacement keytops invites one to sit down and play.